August 16, 2016 – New Orleans. Atelier Vie, home of Real New Orleans Spirits, is pleased to announce that the distillery has expanded distribution to Mississippi and has released an initial list of Mississippi retail accounts. “Mississippi is right next door to Louisiana and we’ve been working on getting into Mississippi for a long time,” said Jedd Haas, President of Atelier Vie. “We’ve had numerous visitors from Mississippi come to the distillery over the years. They all ask when they’ll be able to buy our spirits at their local stores. We’re pleased to inform all our friends in Mississippi that the time is now,” Haas continued. While distribution in many states, including Louisiana, is handled by private distributors, Mississippi is a “control” state where the state purchases and distributes spirits to private retailers. Atelier Vie has appointed Steve Tonore & Associates as their Mississippi broker to solicit orders from retailers. All Atelier Vie spirits are now available from the Special Order Desk of the Mississippi ABC. 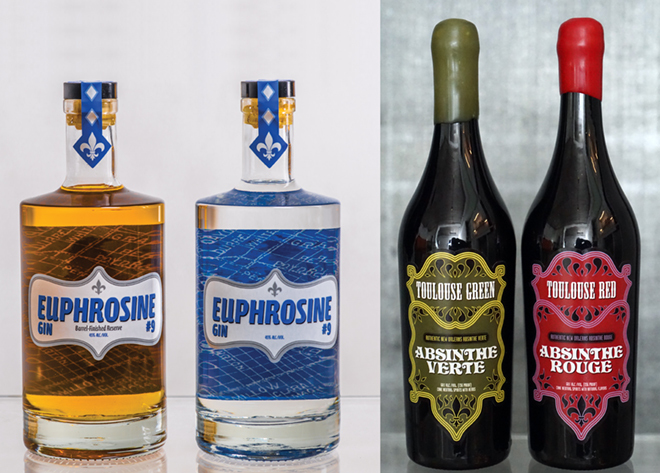 Atelier Vie distills Euphrosine Gin #9, a flavorful American gin; and also distills a barrel-aged version of Euphrosine, called Barrel-Finished Reserve, which is aged in American whiskey barrels. The Atelier Vie line-up also includes Toulouse Green, Absinthe Verte, a traditional-style absinthe based in part on French recipes from the 1800s and distilled with Louisiana wormwood; and Toulouse Red, Absinthe Rouge, a “new school” American absinthe colored red with hibiscus and excellent for cocktail mixing. Atelier Vie also sells Buck 25 Vodka; an overproof cane vodka designed for creative mixologists to craft their own spirits flavors through rapid infusion. A high resolution version of the image included in this release is available for print use on request. This entry was posted in Atelier Vie, Barrel-Finished Reserve, Buck 25, Euphrosine Gin #9, Press Releases, Toulouse Green, Toulouse Red. Bookmark the permalink.